Brandon Jennings‘s incomparable Cali-born swagger is part of the reason he’s in the NBA. When we’re finally able to measure player confidence, we’ll find that Jennings’s confidence in Jennings borders on the absurd and so far that’s been enough. Despite miserable shooting that’s followed him from Italy to Milwaukee to Detroit, he keeps finding work as a starter, but how long will it last under the no-nonsense regime of Stan Van Gundy? Just three games into the 2014-15 season and incumbent journeyman point guard/tight beard-line wearing D.J. 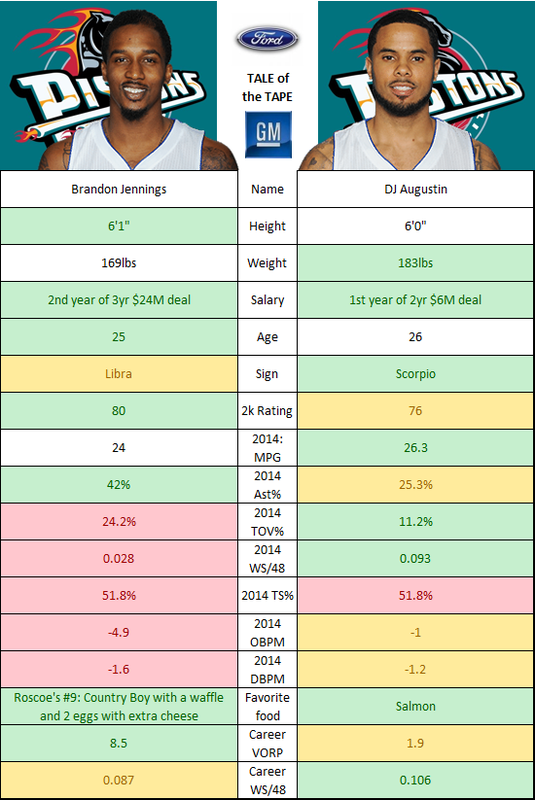 Augustin is creeping into Jennings’s minutes like a spider nibbling away at his ink-covered skin in the night. And Brandon is not happy! Or is he? Thanks to http://www.basketball-reference.com for all these great stats.